TechSmith SnagIt is a screen capture software. Using SnagIt, you can easily capture anything you want on the screen. After capturing the screen, SnagIt lets you edit that capture in an extremely easy way. It’s a must have tool for bloggers. If you decide to buy SnagIt, it will cost you around $39.95 USD. But now you can get it for FREE. Visit the promotional offer page for SnagIt. 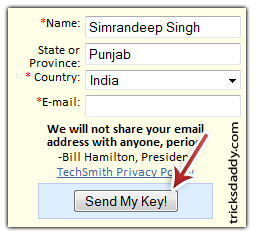 Fill up your details in the form given on right side of the page and hit Send My Key! button. Now click on Sign Me Up and you will shortly receive your key in your mail box. After installing SnagIt 7.2.5 you will be eligible to upgrade to the current version, SnagIt 8.2, for just $19.95 USD (The original cost of which is $39.95 USD). You will also get the newest version of SnagIt 9.1 for 50% off the full purchase price. Thanks Simran for sharing the trick and Gaurav (Orkutplus) for recommending me this tool. Simran, thanks for this. Will try submitting the details now. BTW, i am visited your blog for the first time. Sorry to publish your comment later. Actually it was marked as spam by Akismat plugin. It seems that the offer is no longer valid as the promo offer link is now giving a 404 page.Sad to miss this..
vbbÂ´s last blog post..How to Extract Text from Images for Free! Cool. I was looking for a free version of SnagIt from a long time. Thanks for the useful info. I just downloaded the free version. I used Browsershots for getting screenshots of my blog and others.